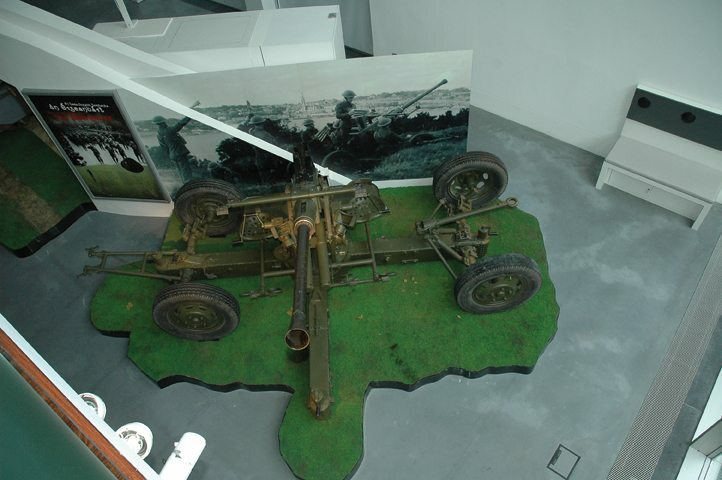 On display in the Soldiers & Chiefs Exhibition at the National Museum of Ireland is a Bofors L60 light anti aircraft gun, one of the few surviving weapons that opened fire on unauthorised aircraft during the Emergency. The Bofors L60 gun on display in the Soldiers & Chiefs Exhibition at the National Museum of Ireland at Collins Barracks, Dublin. Since then the Bofors L60 gun has become the most successful air defence weapon of the last century. During World War II the British, American, Russian and Germans all used the Bofors. Initially developed as a naval gun as Model No. 1934, in 1936 Bofors Company of Sweden created a land-based model, the Bofors L60 1936. The new 40mm gun was designed to counter low-level aircraft flying at altitudes up to around 3000 metres. Heavy anti aircraft guns could tackle high altitude aircraft such as bombers while machine guns were on hand to counter low-flying aircraft. The Defence Forces purchased four Mark I L60s from England, where they were made under licence, in June 1939 and a further two Mark III L60s in May 1943. In 1952 twenty-four Bofors L60 1936 were purchased from the Bofors company in Sweden and used by the reserve units of the 1st Air Defence Regiment in Dublin, Cork and Limerick until 2002. Anti Aircraft Battalion with 3 medium and 1 light batteries. 4 Gladiator aircraft from Air Corps. In many ways the Anti Aircraft Battalion, as it was known at the time, was a front line unit and 217 rounds of ammunition were fired by the 40mm anti aircraft guns from 1939 to 1943. The principal weapon of the Anti Aircraft Battalion was not the Bofors L60 but the larger 3.7inch AA gun, stocks of which went from two in 1940 to eighteen by 1943. The remaining weapons were the six Bofors light anti aircraft gun and four 3-inch AA guns. The initial standing orders were that all anti aircraft positions were to open fire on all unidentified aircraft which were reasonable targets. The last such shoot was on 31st May 1941 during the North Strand Bombing in which 31 civilians were killed. After this date only a Brigade commander could authorise the opening fire against aircraft engaged in bombings. A new variant of the Bofors 40mm anti aircraft gun is still in service with the Defence Forces. The E/L70 Bofors with the Flycatcher radar is now in service with the 1st Battery of 1st Air Defence Regiment, based in Defence Forces Training Centre, as well as 2nd Battery in Dublin, 3rd Battery in Limerick and 4th Battery in Cork. The Bofors that is on display in the Exhibition is originally numbered L29 and was restored with the assistance of Artillery Corps and Hughes Fabrication.